1. We could think of freeing up at least the commercial sector from the national grid and powering it by solar energy will save up to 3000 MW. The Earth is locked on an “irreversible” course of climatic disruption, generate your own clean energy instead of paying for traditional electricity. By commercializing energy sources that reduce greenhouse gas emissions and for home owners as well, it pays to produce your own power all you have to do is to rely on solar energy. Investing in a solar energy system for your home is one of the best ways to save money. You can permanently reduce your electricity costs with a solar system. We can contribute to a more secure and sustainable world. 2 What’s the problem? The pain point is that you want to reduce your spending on energy bills and have uninterrupted power supply during hours of load shedding. Either as an industrial unit, you currently are paying a commercial tariff on electricity consumed from the national grid. Or as a house-hold disrupted by frequent load-shedding. Solar power can actually cost less than you pay now with low, locked-in rates. Dozens of homeowners are already enjoying the benefits of clean, affordable energy through our services. 3. Do you run a business? Can you see light at the end of the tunnel? Our payback time guarantee entails free energy in couple of years. We make it easy. Your experience is our top priority, starting the moment you contact us. The only automated process that will help for corporate customers. Add to that the many purchasing incentives and rebates available for solar energy and your investment looks even better. Saving money while saving the planet–what could be better? 4. Handling everything from project proposals to EPC (Engenering,Procurement,Construction) – O&M(Operation & Maintenance). Value Chain: We start by Energy auditing (catering to your requirements), submitting our energy efficient recommendations and optimized solutions. Now you are well informed, you might like to turn your roof into a power house. We are proud to set standards not only in our technological advancement, but also in our marketing and brand-building activities. 5. Challenges make us stronger and we enjoy the satisfaction of a job well done. This technology is abused by the so-called stakeholders who share the market. We are one of the few solar electric companies in Pakistan with engineers certified by Energy practitioners. We have come up with a strategy where we out beat their inferior services by continuously monitor each solar power system that we install to ensure everything’s running smoothly. It’s because for us HAPPY CUSTOMERS = Business. We also provide limited warranty coverage and repairs at no added cost in the rare event problems arise. 6. Are you ready to contribute to Energy Economy in these dire ages of electricity crises? Are you willing to engage with supreme quality energy service providers? The savings can add up to thousands! Our team will take care of everything. Once scheduled, your solar power system installation can take as little as one day. Zorays Solar chooses only the most efficient and cost-effective components from proven manufacturing partners. For example, we use some of the the world’s most powerful and efficient solar modules to generate more electricity in the same roof space. From the smallest bolt to the largest array assembly, we aim to exceed industry standards with every installation. In addition to having a highly-trained professional workforce that has completed hundreds of installation projects, Zorays Solar Bijli Pakistan also employs several certified workers. Whether you choose us to work on something as dear to you as your home, or business entrusts us with a sophisticated, large-scale installation, Zorays Solar Bijli Pakistan makes the commitment to get the job done-on budget and on time. Team Zorays’ customer satisfaction rating stands very high, and that has everything to do with customer relationships. From the first time we meet you, we ask you the right questions and listen to your answers to develop a plan-with you-that will meet your needs and budget. It is our hope that by the time our initial meetings are over, you too will be a solar expert! Affordability and quality don’t always go hand-in-hand. 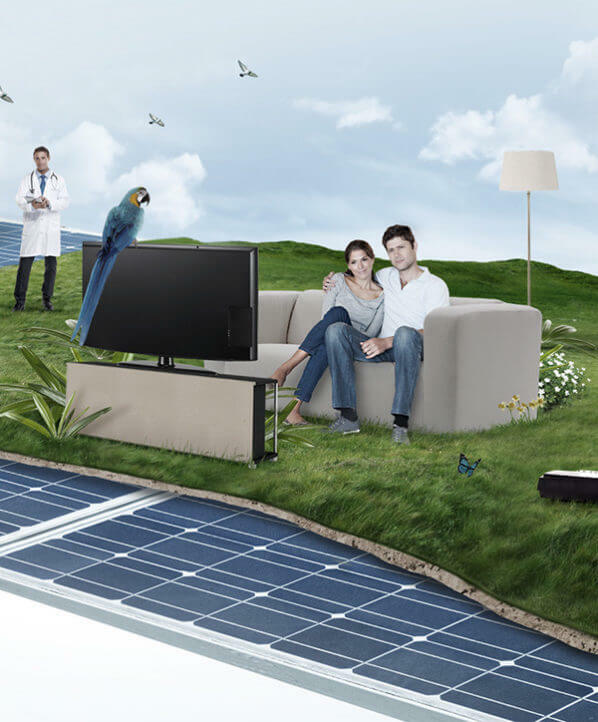 With Green Philosophy Zorays Solar will always choose the highest quality, most efficient products for our customers because our solar is designed and intended to last for decades to come. Our products come with industry leading warranties. We will stand with you to find the best financing options. And we stay with you to navigate the federal, state, and local tax incentives. That is meaningful value.